Marilyn SanClemente June 29, 2017 June 29, 2017 All Occasion Card, All Occasion cards, handmade card, Handmade cards, New catalog, Stampin' Up! 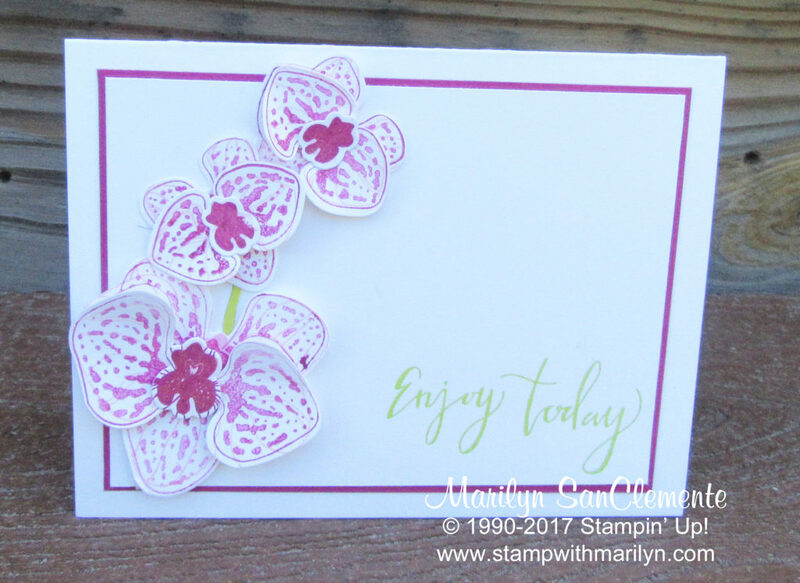 Today I am sharing a h andmade Orchid card that I made with the new Stampin’ Up! Climbing Orchid stamp set... For those of you that know me, I am a flower lover and orchids are one of my favorite sets. So of course when I saw this set – I had to get it! So I have had some fun playing around with it. I am going to record a video on how to use the pieces to make different looks. I can see some great decorative 3D items with this set! The card base on this card is cut to 5 1/2″ x 8 1/2″ and scored at 4 1/4″. The second layer is a piece of Berry Burst cardstock cut to 5″ x 3 3/4″. The whisper white cardstock layer is cut to 4 7/8″ x 3 5/8″ which is layered onto the Berry Burst layer. The “enjoy today” is stamped using the new in-color Lemon Lime Twist ink pad. The Climbing Orchids stamp set is a two part stamp. Two part stamps allow you to get more depth on the flowers. You can stamp the outline of the flower in one color and then stamp the inside in a coordinating color. The other great advantage to this set is that you can purchase the set and the coordinating framelits together in a bundle and save %10! Each orchid is made up of 3 pieces. The base of the orchid, the two leaf petal and the flower center. For each piece of the orchid, there are two stamps, an outline stamp and a detail stamp. The exception is the center of the flower which is just one piece. The orchids are stamped on scraps of Whisper White cardstock. The outline of the flower is stamped with Blushing Bride ink. The detail of the flower petal is stamped using Berry Burst ink – stamped off. This means ink up your detail stamp that lines up with the outline image and then stamp the image on a piece of scrap paper. Then stamp the image a second time on top of the outline image. You get a layer of Berry Burst that is not quite as intense. The center of the flowers are Berry Burst stamped at full strength. They are not “stamped off” first. Next cut out the orchids using the handy matching framelits! Each orchid is assembled using a dimensional to attach the double petal to the base of the flower. I very carefully bent the flower petals to give them some lift. You want to be careful to not crease the flowers but just slightly bend them. I placed the orchids on the card first to figure out where the stems should be stamped. The stems are stamped with Lemon Lime Twist ink. I hope you have enjoyed these cards today! Here are the products that you need to make these cards. Creative Crafter’s Escape was the best!